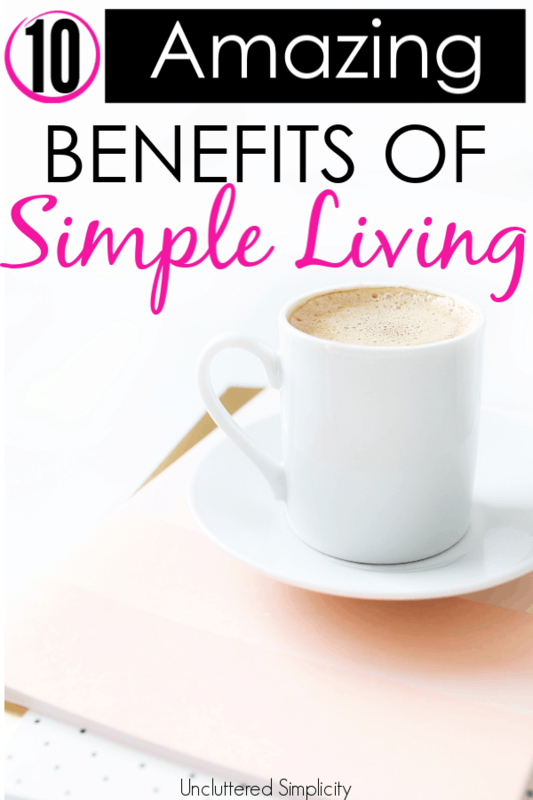 Maybe you’ve heard the buzz lately about the simple living/minimalist movement. I’ll bet you’ve even heard of (if not already read) the best-selling book: The Life-Changing Magic of Tidying Up by Marie Kondo. Have you been wondering if this lifestyle is for you? Perhaps you’ve been longing to live a simple life, but you’re not sure if it’s worth it. All of the hours you’ll need to spend decluttering your stuff, saying “no” to extra activities and overtime, having to change your spending habits. And for what? Why not just keep going on the same path you’ve always known? After all, it’s easier. Should you even bother trying to simplify your life? Maybe you have never even heard the term, “simple living”. Therefore, you have no idea what it means to “simplify” your life. One of the best reasons for choosing to live a simple life is that doing so will save you money. Because simple living lends itself to buying less, you will no longer be spending your hard-earned cash on replacing, repairing, maintaining, and insuring your stuff. In my post on reducing your wardrobe, I explained the concept of decision fatigue which states that the more decisions a person makes in a day, the less effective those decisions become. Rather than using vital energy on ultimately meaningless decisions like’ “should I stop at McDonald’s or Burger King on my way to work,” eliminate this option altogether. Purchase muffins at the bakery prior to the workweek and make some coffee at home before you leave. This ties into reason #1 because it will also save you money. Wouldn’t we all like to be able to spend more time with our loved ones? A simplified life frees up time in your day. Therefore, you will have time available on the weekends to visit with your long-lost family and friends. You may even be able to reduce your work hours so you are home earlier and can take your kids to the park. Are you tired of the never-ending cycle of keeping all of your stuff clean? The less you have, the less you have to clean. It’s a breeze to keep surfaces clean when they don’t have piles of stuff on them. Floors are easier to vacuum and mop when they have a manageable amount of furniture on them. More time, more money, less stuff to clean. Yes, please! It’s much easier to be available to others when your schedule isn’t stuffed to the brim. When you live a simple life, you have more time to live out your faith by showing love and serving your fellow man. Helping at your local homeless shelter will no longer have to be a once per year occasion. Instead, it may become a regular event on your newly cleared calendar. Joshua Becker, of Becoming Minimalist, lists many benefits of the effects of owning less while raising children. One of these benefits is that, by living a simpler life, children learn that we don’t need to buy things to be happy. Our children will learn from the examples we set. When they see we are more content with less, they will be too. While it can become more difficult, the older your children get, to convert them to simple living, it is never too late to start. I don’t know about you, but I hate to lose things. More than that, I hate it when I have to replace things once they are lost. In fact, I have a confession to make: I know where everything is in my house. Seriously. Even my husband’s stuff; as well as practically everything my three kids own. This would not be possible if my home were full of clutter. It’s only by choosing to live simply that I have been able to accomplish this. However, that pesky remote still manages to disappear at least once per day. Once you’ve taken the leap into simple living, you will find that it affects many different aspects of your overall health. When you realize how good it feels to be rid of the weight of your stuff, maybe you’ll decide to lose some weight of your own. You may notice a decrease in your blood pressure, anxiety or smoking. Possibly, you’ll start preparing healthier meals, implementing an exercise routine, or getting outside and breathing in the fresh air. I have three boys, so the “no running in the house” rule is not required in my home. Even though our house is on the small side (under 1200 square feet), our kids manage to play soccer, wrestle and have multiple friends over at once. Maybe you don’t have children and would like to use your space for something else. After clearing the excess clutter, you will be able to use the open space for anything you want including, a dance floor, art studio, or an exercise area. Or, you could just leave it empty. When you choose a simple life over a cluttered, complicated one, you will unearth more time in your day. You will be free to use this time to engage in activities that truly inspire you. You will have more time for reading, creating, learning, listening to music, traveling, and appreciating the abundance of life. The opportunities are endless. If you’ve been contemplating a simpler life, but have been holding back because of the work involved in getting there; go ahead, take the plunge. You’ll be glad you did!